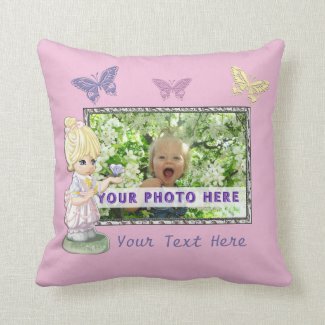 Personalized Photo Pillows with YOUR PHOTO and some with YOUR TEXT along with INSTRUCTIONS on How to Make these beautiful Customized Pillows with Pictures. 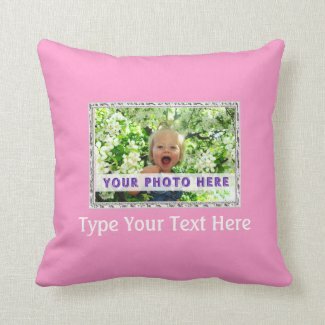 SCROLL DOWN to see more Custom Photo Throw Pillows. Your Photo and Your Text. Easy to Use Photo and Text Templates. Cute Little Girl Statue and her Butterflies. 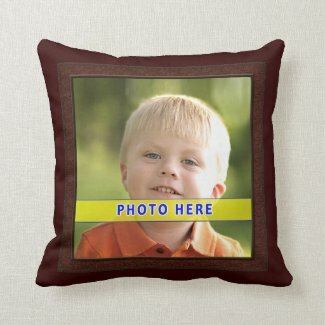 Once you are on the Personalized Pillow product page, Under the “Personalize it” section, Click the tiny blue word “Change”, Click “Upload New Images” then choose your favorite picture then Click “OK”. 100% “LOVE IT” Zazzle Guarantee. I am so impressed by the Less than 1% Return Rate and their Customer Service is excelllent. The Printing is “Second to None” and they earned an A+ Better Business Bureau Rating. 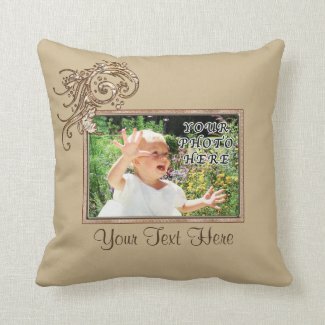 Gorgeous Customized Pillows with Pictures Printed on Them Customized Pillows with Pictures and Text. Look at the back of this pillow. Beautiful ornate golden scroll with a that is metallic and glassy like. Your image is framed by a neutral frame and accented with the scroll. Look at the beautiful Scroll on the back and front of these Customized Pillows with Pictures on Them. These are nice gifts for inlaws who have everything, grandparents and parents. Once you are on the Photo Pillow Product Page, you can click the big “X” in the Upper Left Side for a close up view. A Watermark “Z” for Zazzle is over Picture Pillows but you can see it closely. I just love the scroll. It has an ornate glassy look. Frame Sets Your Photos Off Beautifully. ADD Your Two PHOTOS. Rich Bordeaux Background Color can be changed. See the Instruction by Clicking “Read More” of the Product Description once you are on the Zazzle Photo Pillow Page. Little Linda Pinda Designs are Original and Unique Gifts for Creative People.